2014 was a cool and rainfall sufficient vintage at the Whalebone Vineyard in Wrattonbully. The 40 year old vines received 121% of average annual rain from May 2013 to April 2014 at Whalebone Vineyard for vintage 2014. The wet winter and spring were also much warmer than average, by about 1.5ºC. This unusually warm, early and damp start to the season accelerated shoot growth which competed for energy with the flowering process in late November, causing “coulure”, or the failure of whole flowers to set fruit and to drop off the vine. In November a sudden drop in average temperatures exaggerated the “coulure” effect by causing the flowers that remained to set poorly, the hen and chicken effect of “millenderage”. This affected the early flowering Merlot more than the later ripening Cabernet Franc and the crop level was significantly reduced. Frequent beneficial rainfalls through the growing season followed the wet 2013 winter. The heat summation for the 2014 growing season at Whalebone was 1414ºC days compared to the average for the past 10 years at 1486ºC days. At Whalebone Vineyard the Merlot grapes were harvested late on the fifth of April and the Cabernet Franc on the fifteenth of April, both at 24 Brix sugar and with perfectly mature tannins, colour and flavours. The hand selected bunches of Merlot and Cabernet Franc from Whalebone Vineyard were separately de-stemmed, partially crushed and chilled to 2ºC into tubs each containing 0.9 tonnes. The maximum temperature reached at the peak of fermentation was 34ºC and after the completion of fermentation the tubs were sealed down for 7-days post fermentation maceration. The tubs of Merlot and Cabernet Franc were separately tipped into a small airbag press and pressed straight to French oak barriques, 60% new and the balance 1 use. Malolactic fermentation occurred in barrique in the spring, the barriques were then racked off full lees and the wines were sulphured and returned to barrique for another 18 months. In April 2016 the wines were clear racked from barrique and 68% Merlot and 32% Cabernet Franc were blended ready for bottling in May 2016. Tapanappa 2014 Merlot Cabernet Franc is an intense cool year wine with vibrant Merlot plum fruit, reminiscent of Christmas pudding fruit and Cabernet Franc floral and leafiness and refined but determined tannins. It is an elegant wine with loads of primary varietal fruit. The colour is medium density and purple edged, the aroma is of cigar box and complex ripe fruit and the earthy terroir nuances of the Whalebone Vineyard. The core of the wine is sweet and refined but the finish is of gentle savoury tannin. 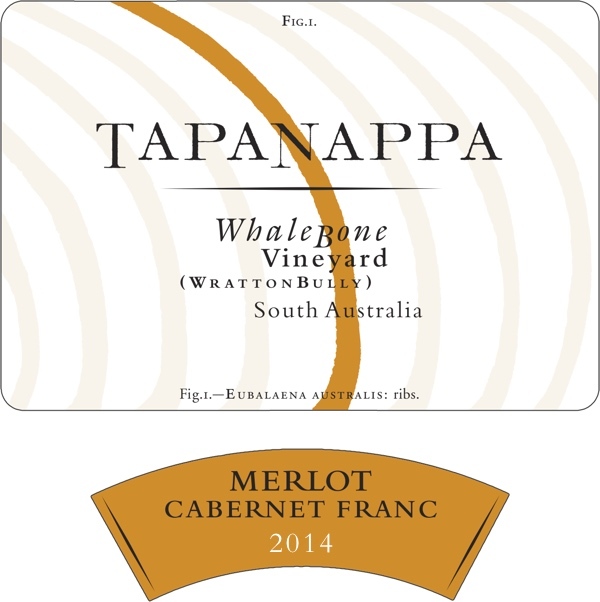 2014 Tapanappa Merlot Cabernet Franc is a keeper! Only 240 dozen grown and made.